On a cold, misty morning, 54 members and 2 visitors were warmly welcomed by the President Kate Dilks. 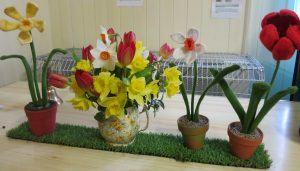 Apologies were noted and coffee hostesses were thanked as was Margaret Ritchie for her lovely arrangement of Spring flowers and display of knitted Spring blooms. After an enjoyable coffee break, the invited speaker, Lara Murphy was introduced. 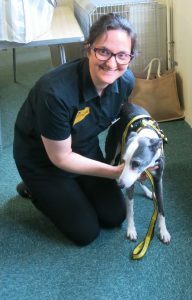 Lara, a representative of the Dogs Trust, who was accompanied by her friendly whippet, Maisie( who slept during the talk), gave a most interesting account of the Trust’s work. The Trust relies entirely on donations and legacies to fund its work. Founded in 1891 the Dogs Trust was formerly known as the National Canine Defence League and its aim has always been to campaign against cruelty to dogs and to look after their welfare. No healthy dog is ever destroyed by the Trust. In 1978 the slogan “a dog is for life, not just for Christmas” was created in an effort to deter the giving of puppies as gifts. Sadly, every Spring many of these puppies, now much bigger and needing more care and exercise are given to the Trust for re homing. Canterbury is the nearest re homing centre to us where the dogs are housed in kennels with underfloor heating and sleep on duvets! A vet comes twice weekly to inspect the dogs and treat any health issues. A major problem today for the Trust is the illegal importation of puppies from abroad often they are physically unwell and need much care. The government is making efforts to stop this activity but it is an ongoing concern and the Trust works hard against it. Gillian Roffey gave the vote of thanks.